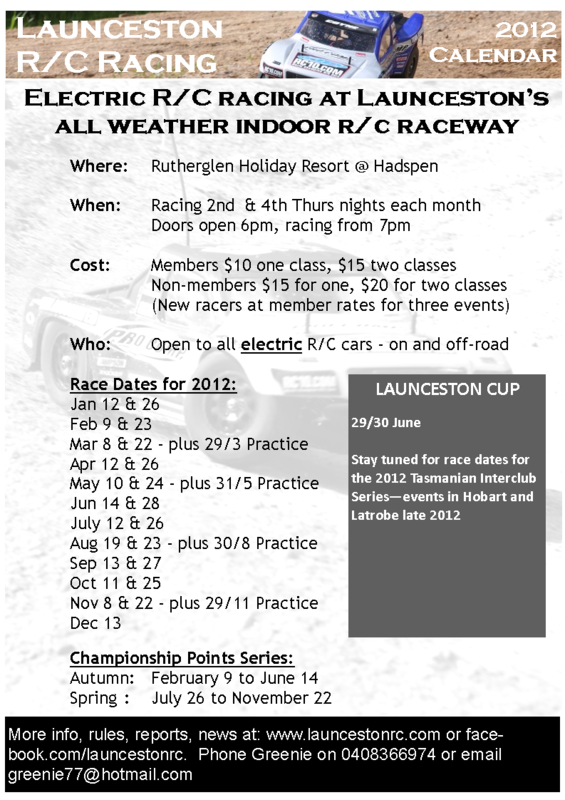 Club racing at Launceston in 2012 will take place on the second and fourth Thursday night each month. Where there are five Thursday nights in a month the track will be open on the fifth Thursday will be open for practice (half race-fee applies). Club committee meetings are the first monday night, of each second month. For the rest of 2012 meetings are: May 7, July 2, September 3, November 5. Club Annual General Meeting will be Thursday August 30th. On race nights the doors at Rutherglen will be open by 6pm, with racing underway by 7pm. There are two Championship points series in 2012. Each series consists of nine events, with each racer’s best 8 results to count. There are two non-points events in June/July to allow for Launceston Cup, new track layout etc. Race fees for 2012 are unchanged.